EXPLOSION PROTECTED PRODUCTS - Site de botex-international ! 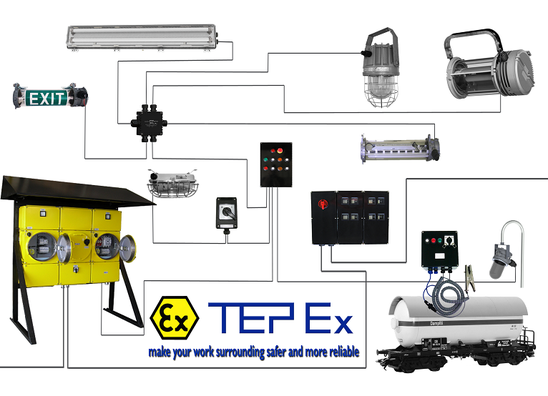 TEPEx is a regional leader in manufacturing of explosion-protected electrical equipment. Through continuous development of new products and markets, modernization of technology and investment in company employees and organizations, TEPEX continues the tradition of more than 60 years of experience in the field. TEPEX products are intended for use in potentially explosive atmospheres of gases, vapors and dusts in industries such as refineries, offshore installations, petrochemical industry, chemical industry, pharmaceutical industry, food processing, shipbuilding and underground mining. TEPEx products are certified according to the ATEX Directive 94/9/EC.